Grain for Pain INC is a Non-Profit organization focused on fighting hunger in the Northern part of Africa. It started as a campaign of Miak Wadang (Hope for Tomorrow) in 2010 when drought caused famine in South Sudan to people that were already fighting for their survival. Miak Wadang (miakwadang.at) is a non-profit community development organization from South Sudan. Grain for Pain raised funds from North America and Europe and successfully delivered sacks of grain to more than 10 000 people along the White Nile and the Upper Nile area of South Sudan. After people came out of drought, there was significant progress made towards restoration and stability in the country. Miak Wadang, together with the local community, planted a large community garden, the seeds purchased from Grain for Pain were planted and there were crops in the next season. Also, there was a school started in the region that provided schooling for more than 200 children in Nyeyok area. Miak Wadang was preparing to start the construction of a multi-purpose building that would house a hospital, school and housing for the local community. On December 15th, 2013 a conflict among the government officials spread at a national level and it started consuming the youngest nation on Earth from the inside out. United Nations declared a level 3 crisis in South Sudan. The numbers of people affected by this conflict are in the millions. We realize that the need is greater than any one organization or even all of them combined could cover, but we feel a sense of responsibility for the local community that Miak Wadang members have faithfully served for close to 40 years. In 2015, we partnered with Together for Africa, a community development organization in Uganda and we plant our own grain in the northern part of Uganda. That has proven to be the best opportunity so far. We planted quality seeds and we were able to have 2 crops so far. We would like to acquire more land and plant more crops for South Sudan and the rest of Northern Africa. We want to keep our campaign simple and transparent. 95% of all the funds we raise for Grain for Pain go to the people in South Sudan. The 5% is needed for bank fees, transactions and fees to keep existing as a Non-Profit organization. Everyone involved in this project is a volunteer, we do not have infrastructure or extra organizational costs. Normally, we like to keep the cost for a sack of grain to 10$ (costs vary in that part of the world). 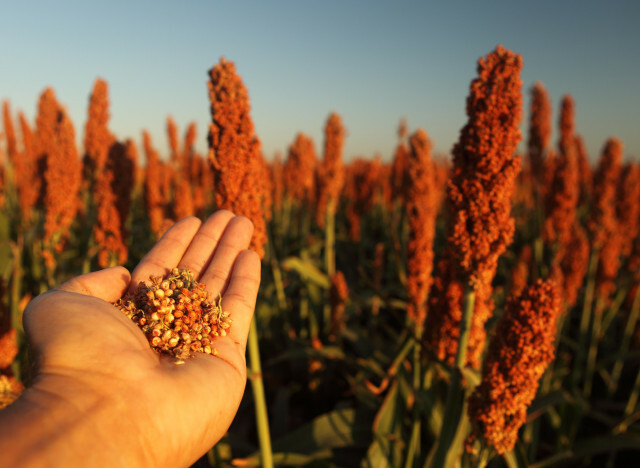 The grain we work with is sorghum (view image). Usually one sack of grain is 110 pounds. After we have raised a significant amount of money, we transfer the funds to Uganda so we can buy seeds, pay workers and plant. After we have crops, we harvest and transport to South Sudan. In South Sudan, our partners from Miak Wadang are responsible for the grain, distribution and safety of the grain. One sack of grain feeds a family for a few months. There are other projects Miak Wadang, our partner in South Sudan is engaged with that deal with sustainability and community development, Grain for Pain is a response to the urgent need for food in order for people to survive. We believe in a holistic approach to helping someone in need, we believe we need to care for the body, the soul and the spirit, that is why we are partnering with diverse groups of people, organizations and institutions that help us offer support in all areas of life. Because the situation in South Sudan is very unstable, we ask for your consideration if we would have to reinvent ourselves as far as the method of delivering the grain, or what type of grain and food would be needed. Our commitment to you and the people of South Sudan is that one way or another the grain will be delivered to them. We will keep you posted on the development of this campaign through our website and Facebook page. That (and much more) is how Grain for Pain works.